The Fokker E.V was a German parasol-monoplane fighter aircraft designed by Reinhold Platz and built by Fokker-Flugzeugwerke. It entered service with the Luftstreitkrx�fte in the last months of World War I. After several fatal accidents due to wing failures, the aircraft was modified and redesignated Fokker D.VIII. Dubbed the Flying Razor by Allied pilots, the D.VIII had the distinction of scoring the last aerial victory of the war. In early 1918, Fokker produced several rotary-powered monoplane prototypes. Of these, Fokker submitted the V.26 and V.28, small parasol-winged monoplanes with his usual steel-tube fuselages, for the second fighter trials at Adlershof in May/June 1918. The V.28 was tested with both the 108 kW (145 hp) Oberursel UR.III and 119 kW (160 hp) Goebel Goe.III, though neither of these engines were ready for operational service. The V.26 utilized the standard Oberursel UR.II engine, producing only 82 kW (110 hp). While this engine was obsolete, the V.26's low drag and light weight meant that it was nevertheless quite fast. 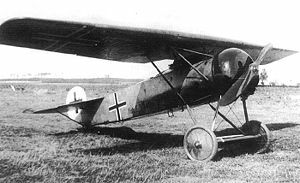 The Fokker designs were only barely beaten by the Siemens-Schuckert D.III with the complex bi-rotary Siemens-Halske Sh.III engine. In the end, the V.26 was ordered into production as the Fokker E.V. Four hundred were ordered immediately with either the UR.III or Goe.III. Because neither engine was available in any quantity, all production examples mounted the UR.II. The first production E.V aircraft were shipped to Jasta 6 in late July. The new monoplane was also delivered to Jasta 1, Jasta 19, Jasta 24 and Jasta 36. Leutnant Emil Rolff scored the first kill in an E.V on August 17, 1918, but two days later he was killed when his aircraft's wing collapsed in flight. After another E.V of Jasta 19 crashed, the Idflieg grounded all E.V aircraft. Pending the investigation of these wing failures, production ceased at the Fokker Flugzeugwerke. According to Fokker, the wing failures were caused by the army technical bureau, which had forced him to modify the original design by over-strengthening the rear main spar. This faulty design allegedly caused the wing to twist and fail. Fokker claimed that this defect was resolved by reverting to his original design. According to most other accounts, the source of the wing failures lay not in the design, but in shoddy and rushed construction. Fokker had subcontracted construction of the E.V wings to the Gebrx�der Perzina Pianoforte Fabrik factory. Due to poor quality control, the spar "caps", forming the upper and lower members of each spar assembly, had been placed too far apart during the fabrication. Because the resulting spars were vertically too large to pass through the ribs, excess material was simply planed away from the exposed upper and lower surfaces of the cap pieces, leaving the assembled spars dangerously weak. Other problems included water damage to glued parts, and pins that splintered the spars, rather than securing them. Tests showed that when properly constructed, the original E.V wing had a considerable margin of safety. Satisfied that the basic design was safe, the Idflieg authorized continued production after personnel changes and improved quality control measures at the Perzina factory. Deliveries resumed in October. At the suggestion of the Kogenluft (Kommandierenden General der Luftstreitkrx�fte), the Idflieg redesignated the modified aircraft D.VIII. Henceforth, the "E." and "Dr." designations were abolished and all fighters received the "D." appellation. The first new examples of the D.VIII started arriving at frontline units late that month and started operations on the 24 October with Jasta 11. Jasta 5 was issued a D.VIII. The famed ace Erich Lowenhardt used the aircraft for a short time and scored a few victories in it, but he continued to favor the Fokker D.VII. A total of 289 aircraft were produced. Some reached Holland, Italy, Japan, the United States, and England as trophies, but most were scrapped in accordance with the terms of the Armistice. The Polish Air Force captured 17 aircraft, but only seven (six E.V and one D.VIII) were in airworthy condition. All were used against Soviet forces in the Polish-Soviet War of 1919-1920. Lieutenant Stefan Stec earned the first kill for the Polish Air Force by shooting down a Ukrainian Nieuport fighter on 29 April 1919. In 1921, the remaining Fokkers were withdrawn from frontline units and transferred to the Szkoła Obsługi Lotniczej (Air Personnel School) at Poznań-Ławica airfield. V 26 : Initial prototype. V 28 : Prototype fitted with either the 108 kW (145 hp) Oberursel Ur.III, or the 104 kW (140 hp) Goebel Goe.III rotary engines. V 30 : Single-seat glider. Belgian Air Force operated a single captured E.V from 1919 until the early 1920s. Luftstreitkrx�fte received 381 aircraft before 11 November 1918. Royal Netherlands Air Force received 20 D.VIII aircraft sold by Anthony Fokker in 1919. Polish Air Force captured 16 E.V and one D.VIII aircraft, but only 7 were operated. Last E.V was still on inventory in 1924. Soviet Air Force captured one aircraft during the Polish-Soviet War and operated it until the mid 1920s. The fuselage of one D.VIII is preserved at the Caproni Museum in Trento, Italy. Weyl, A.R. Fokker: The Creative Years. 1988. ISBN 0-851778-17-8.